The boss of a French company which distributed defective breast implants around the world has been sentenced to four years in prison for fraud. Jean-Claude Mas, the founder of the PIP company, was also fined 75,000 euros (£63,000) by a court in Marseille. He will remain at liberty until a French court hears an appeal lodged by his lawyer. PIP's sale of faulty implants caused a global health scare which affected about 300,000 women in 65 countries. The company was found to have used sub-standard silicone gel - rather than medical-grade silicone - which the result that many implants ruptured. Apart from Mas, four other former PIP executives were convicted and given lesser sentences. With more than 5,000 women registered as plaintiffs in the case, and about 300 lawyers, the trial was considered one of the biggest in French legal history. The health scare came to public attention in 2011 when the French government recommended that women have PIP implants removed due to an abnormally high rupture rate. There was confusion as British health authorities said there was no need for routine removal. However, they later agreed to remove the implants to put women's minds at rest. The issue of whether the sub-standard silicone used in the implants posed any danger was not resolved by the trial, AFP news agency notes. 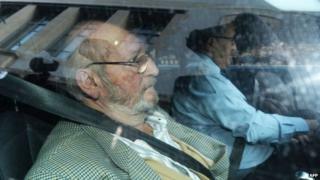 Mas, 74, showed no sign of emotion as sentence was passed. His lawyer, Yves Haddad, blamed the severity of the sentence on pressure generated by the media, and said he would appeal, meaning that Mas will remain at liberty until the outcome of a further hearing. He and the others had all admitted to fraud. PIP's director-general was sentenced to three years in prison, two of which were suspended. The company's head of quality control received two years, one of them suspended, and the head of research and development was sentenced to 18 months, suspended. Throughout the trial, Mas had denied the silicone used was harmful while all but one of the other defendants said they had not been aware of the risks. When an implant ruptures, the silicone gel filling can leak into the body. Some women will not notice anything at all, and there is no evidence of an increased cancer risk. However, it can result in the formation of scar tissue that can change the shape and feel of the breast. The gel can be an irritant, causing pain and inflammation. It can also be more difficult to remove an implant once it has ruptured. Jean-Claude Mas likes to present himself as a "maligned pensioner". Again today he shuffled into court in an open collar shirt and mac, almost un-noticed. In the public gallery, most of the plaintiffs had come merely to catch a glimpse of the man who had cheated them. For many, that was enough. You can dispute whether these implants are toxic and dangerous - though the evidence in this trial would do little to reassure you - but the worry and suffering Mas has caused to hundreds of thousands of women is real. On Tuesday the 74-year-old sat impassively on the front bench of the court, as the presiding judge took over five minutes to read a selection from a list of 5,000 women registered as plaintiffs. In police interviews, Mas had dismissed these women as psychologically fragile. Today they are finally registered as the victims of a crime. France's Health Products Agency (ANSM) has to date registered more than 7,500 implant ruptures and 3,000 cases of undesirable effects, mainly inflammations, among the 30,000 women using PIP products in France. In a report released in June, the ANSM said such incidents tended to be under-reported, and so "the number of women actually explanted may be greater than the number of cases reported to the agency". Isabelle Traeger, who received a PIP implant and attended the trial, said earlier that four years would be too little for what Mas had done. "They explained what was in them [the implants]," she told Reuters news agency. "Inflammable substances, substances to make your car work, and that at a certain point they said to the engineer who made them, 'How did you make them? How did you mix together these substances?' And he said, 'You use your best guess'. A UK report into the the PIP implant scandal concluded that the gel material was not toxic or carcinogenic, and did not cause a long-term threat to human health. Nonetheless Mas and others have also been charged in separate and ongoing manslaughter and financial fraud investigations into the scandal. The manslaughter inquiry is related to the suspicious 2010 death from cancer of a woman who was fitted with PIP implants. Are PIP breast implants safe?